The 2019 Subaru Forester gets a complete remodel from the ground up, but did Subaru do enough to get consumers to take another look at the newest makeover. Forester is one of the brands oldest nameplates and this new model is the fifth-generation of the small SUV. One look at the outside says no because the 2019 Forester exterior design changes aren’t extreme. Forester was the number one selling vehicle in the Subaru of America stable, but for the last two years, it’s been second to the Outback wagon. Last year Outback (188,886) was the top dog in the lineup beating Forester (177,563) as Subaru’s number one selling all-wheel-drive vehicle in the stable. Subaru is hoping that will change with the makeover. According to Subaru of America’s CEO Tom Doll, two things will be the difference as consumers take a look at the new 2019 Forester. "The interior is really the differentiator for this car," Doll told Automotive News at the New York International Auto Show. The next-generation Forester gets significant upgrades inside the cabin. It gets new seats up front, all Foresters except the base standard trim come with an 8-inch touch-screen infotainment system, a new electronic parking brake frees up console space, new materials inside, and the SUV will be more spacious overall with rear-seat legroom growing by 1.4 inches. The cabin will also be quieter, thanks to the new Subaru Global Platform Forester now rides on. Subaru calls their top-of-the-line Touring trim, "the most luxurious Forester ever.” It comes with a rich brown interior, 10-way power driver's seat, an 8-way power front passenger seat, heated rear seats and a heated steering wheel. All models will come with a wider rear liftgate opening (+5.3-in.) for easier loading of cargo. All 2019 Subaru Forester trims will now come standard with EyeSight driver assist safety technology. The small SUV will also be the only model in the lineup available with their new driver monitoring system called DriverFocus aimed at preventing accidents. You can read more about it here. 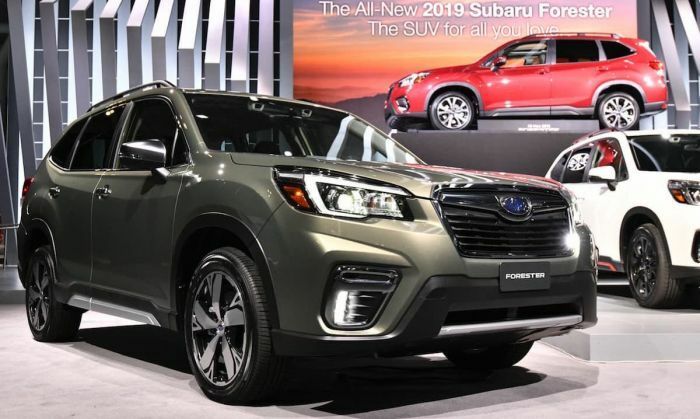 The all-new 2019 Subaru Forester will make its dealer launch later this fall, and it comes with the new Subaru Global Platform making it roomier inside and it will also come with improved driving dynamics and a more fuel-efficient Direct Injection 2.5-liter boxer engine. Subaru says the newly-remodeled interior and added safety features will be the reasons why consumers will rediscover the Forester nameplate. Like the Outback, the Forester Limited model should be available with memory driver’s seat. To be more pet friendly, rear cargo area should have ac ventilation outlets. I own a 2010 Forester and was really looking forward to upgrading to the 2019 model. However, I'm really disappointed that they dropped the XT. Power is going to be lacking compared to the new RAV 4 which will have 200hp in the gasoline version and even more HP in the hybrid. Beware Outback 3.6R owners, Subaru is coming for you - it's a safe bet that engine will be gone when Outback gets the new global architecture. Don't worry, it will still look the same on the exterior. I'd imagine there are more 3.6R owners than Forester XT owners - so we shall see. Question for Denis - what percentage of Outback 3.6R sales make up total sales for the Outback line? My guess is that it's more than 5%.